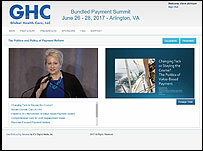 The Seventh National Bundled Payment Summit conference content is now available in a variety of formats. Online Archive of 2017 Bundled Payment Summit Presentations today! Flash Drive of 2017 Bundled Payment Summit Presentations today! Click here to download the conference app to your mobile device. Enter the passphrase “Summit18” to access. number of partial and full Tuition Scholarships to qualifying representatives of local, state and federal government, consumer advocate organizations, safety net providers, academics, students and health services research organizations. Accounting Professionals: Approved for up to 19.00 NASBA CPE credits. Physicians: Approval for 20.00 AMA PRA Category 1 Credits.